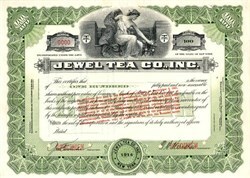 Beautifully engraved RARE Specimen certificate from theJewel Tea Company, Inc dated 1941. This historic document was printed by Republic Bank Note Company and has an ornate border around it with a vignette of an partially clothed allegorical woman sitting holding tea leaves with the company's logo on both sides. There. This item has the printed signatures of the Company�s President and Treasurer and is over 65 years old. This is the first time we have seen this style certificate from Jewel Tea. The Jewel Tea Company of Chicago, Illinois reached a national market for its household products using direct sales and mail order catalogs from 1901 until 1981. Around 1899 Frank V. Skiff went into the business with very little money and resources to sell freshly roasted coffee through a home deliverly service. As business developed, so did his product offerings which included teas, foods, and other home products. In 1901, his brother-in-law, Frank P. Ross, joined Skiff as a partner in the operations of the business. The company grew to over $8 Million in revenues by 1915 and delivered to over a million homes. Unfortunately, Skiff and Ross grew the business too fast and were forced out because they lost control of the operations. The company was that was founded in 1899 ceased operations in 1981. During those 82 years it had a profound effect on the American home, and also on the country during WW2, where they pioneered the C-ration for American troops and turned their factories into making goods for the war effort. In 1933, Jewel contacted Hall China Co. of East Liverpool Ohio with the idea of developing a new pattern of china to be used for a new premium program. Jewel & Hall had done business in past years with other premium offers. The partnership resulted in one of, if not the, largest & longest premium programs in the country. Autumn Leaf ran from its beginning in 1933 to its end in 1976. During that time, some 42,000,000 pieces were produced. Jewel tried a comeback of the pattern in 1978, but it never caught on again.